AROSU launched into 2014 with a very intensive workshop session at consortium member Bamberger Natursteinwerke, where they’ve got decades of experience with structuring stone. 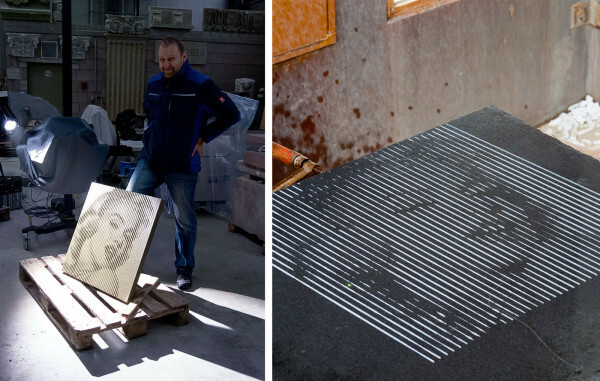 To accurately analyse the existing, manual processes for structuring stone, the team of TU Dortmund put markers onto the masons’ tools and used two high-speed cameras to capture the movement of the tool in 3D-space. Additionally, a re-purposed force-torque sensor captured the forces that resulted from the individual strokes. 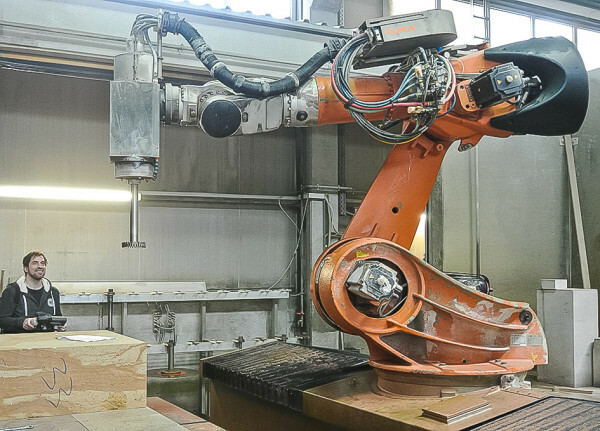 On the robot side of things, the team of the Association for Robots in Architecture verified that the KUKA|prc software environment works well with Bamberger’s heavy duty KR500 robots – machines that are capable of lifting half a ton, or mill through massive stone. 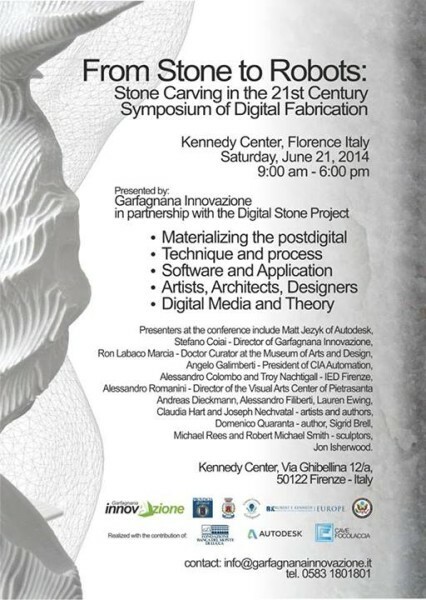 As a proof of concept for stone structuring, the researchers experimented with a dynamic robot program that takes data from an image and turns it into code that has the robot cut a complex surface structure into stone – having the photo reappear as a dynamic shadow. In the second example, much harder black, polished granite was cut with a high-end tool in a similar fashion. In June, the next meeting took place at Labor in Rome, where one of the focuses was the development of a new, de-coupled stone-structuring tool. With all concepts in place, the development and prototyping is now underway, with progress also incurring in the parametric pathplanning as well as the stone-measuring processes. Shortly after the meeting in Rome, the Association for Robots in Architecture presented initial results of the AROSU project at the “From Stone to Robots” symposium in Firenze, Italy to a wide audience of artists, designers and engineers.